This time of year the grocery store and the farmers’ market is filled with vegetables that mimic the colors of the season and are filled with nutrition! This is a complete nutritional guide to their benefits. 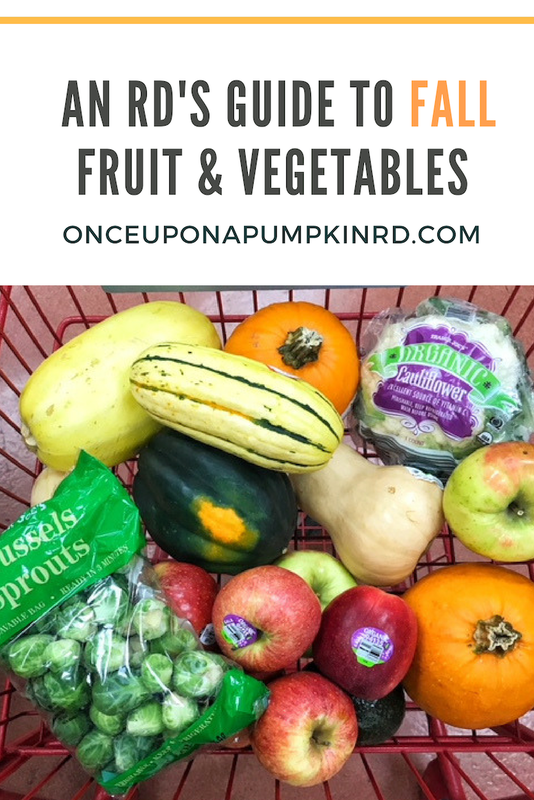 It’s a great time to challenge yourself to pick up a few of the squashes or other cold weather veggies that you haven’t tried before and have fun with them in the kitchen.! That’s why I created this nutritional guide to fall produce as a guide for choosing and using all of the fruit and veggie superstars of the season! They just might surprise you with their taste and versitility! Read on to learn more about all of the health benefits of all of the fall fruit and vegetables you are seeing pop up at grocery stores and experiment with cooking them in your own kitchen this fall and winter! Pumpkin. A true fall superfood, pumpkin is packed with vitamin A, C, K, potassium, iron, and fiber. It’s versatility is pretty amazing and I’m not just saying that because I like putting it into literally everything! Actually considered a fruit and not a vegetable because it has seeds, pumpkins are a part of the winter squash family. The carotenoid beta-carotene gives pumpkins their orange hue and is converted to vitamin A in the body. Vitamin A is important for eye health, and a healthy immune system. It’s also a good thing pumpkin is popular in the fall as the weather changes because it’s high antioxidant properties from the vitamin E, C and beta-carotene (carotenoids also act as antioxidants in the body, with strong cancer-fighting properties) are good for skin texture and appearance, which can take a hit when the temps start to dip. Vitamin C stimulates collagen production in the skin, more reason to “pump” up your foods or even try this homemade pumpkin pie face mask. Remember, jack-o-lantern pumpkins are meant for caving, and when it comes to roasting at home and eating be sure to choose sugar or pie pumpkin. Watch this video I made for how to cut and roast a pumpkin for your own pumpkin puree. Use it all up at once, or freeze it in ice cube trays and pop them out when you want to add fall flavor, texture, nutrition to everything from soups to smoothies! You can roast and eat the seeds of both varieties of pumpkins. If you need more recipe inspiration for how to use it be sure to check out the Once Upon a Pumpkin Cookbook! Apples. The fruit of the season, apples are bursting with fall flavor, and nutrition. Am I the only one who thinks they taste better when you pick them yourself too? Apples are a good source of fiber, containing nearly 17% of your daily requirement. Most of their fiber is in the skin, so give it a good wash and bite right in! Apples are also high in vitamin C–an antioxidant need for collagen production, muscle repair, absorption of iron, and a healthy immune system. Store apples on your counter if you plan to eat them in a couple of days or in the crisper drawer of your fridge in a plastic bags with a damp paper towel if you want them to last 2-3 months. Check out this for more on pumpkin and apple nutrition on the Simple Mills’ blog. Butternut Squash. Also part of the winter squash family, butternut squash like pumpkin is a good source of potassium, fiber and vitamin A. Fiber increases satiety and has been shown to decrease blood pressure and bad cholesterol. Butternut squash may look intimidating to cut and roast, so if you’re in a pitch check your grocery store’s frozen section for pre-cut butternut squash. If you’re picking one from the grocery store or farmers’ market be sure it doesn’t have any deep gashes or dark spots, which could be a sign of mold. Toss onto salads, use as a topping for pizza, or puree for soups all season long to reap its benefits! Delicata Squash. Do you delicata?! The most underrated of all the squashes in my opinion, delicata squash is another fibrous squash that pops up this time of year. Unlike all of the other squashes and pumpkin you actually can eat the skin of delicata squash. Following suit delicata squash is a good source of vitamin C and A, as well as fiber. It tastes a little bit like a sweet potato and can be prepared really easily simply by washing, cutting lengthwise into rings or half moons, sprinkling with salt and pepper and olive oil and roasting. Stay tuned for more delicata squash recipes hitting the blog this November! Acorn Squash. Acorn squash is the dreidel shaped squashes that come in a variety of colors. The nutritional content of these squashes is similar to all other squashes as they also are high in vitamin A, C, fiber, and potassium. I like using acorn squash as a bowl for a grain salad, it’s super festive and requires one less dish! P.s. these seeds are not off limits! They are totally edible and will roast just like pumpkin seeds if you’re up for it. Spaghetti Squash. Spaghetti squash is available year-round, but chances are it’s more noticeable at the grocery store this time of year next to all of the other squashes. I like to call spaghetti squash pasta’s low carb cousin because it’s stringy insides taste just like angel hair pasta, except higher in nutrition and lower in carbs than spaghetti noodles. It’s also a good source of vitamin C, fiber, potassium, and manganese. Cutting can be a little tricky since it’s super tough on the outside. Position the squash on on a non-slip cutting board and cut into two halves lengthwise. 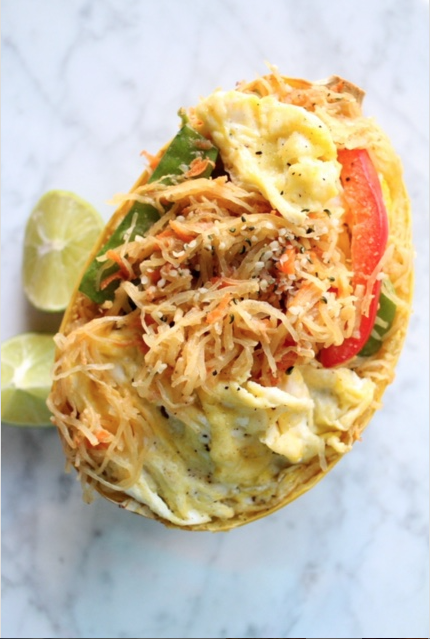 As far as roasting, experiment with my recipes for spaghetti squash pad thai, spaghetti squash fritters, or spaghetti squash primavera! Sweet Potatoes. To me, sweet potatoes are “the other” orange vegetable, but I can definitely appreciate how nutritious and versatile the are, especially this time of year! Sweet potatoes, also known as yams, contain an abundance of vitamin A, C, fiber, and potassium. Bake, broil, stem or toast them up for a healthy source of complex carbohydrates in any meal or snack. Pears. Different varieties of pears start coming into season starting from late summer until winter. One medium pear contain 6 grams of fiber, which is 24% of the daily requirement for fiber (25 grams at least is the recommendation!). They’re super versatile, you can snack on the slices with some nut butter or cottage cheese, or bake them into a muffins and bread. To figure out if a pear is ripe apply a little bit of pressure with your thumb to the top of the pear where the stem is. If it’s soft the pear is ripe, if not leave it on the counter to ripen at room temperature. Kale. Everyone’s favorite leafy green is in season in the fall and perfect for putting a hearty, autumnal spin on your summer salads. Kale is bursting with vitamin K, iron (more than beef per calorie!) and high levels of antioxidants. Add to grain bowls, smoothies and cold weather soups this time of year. I know it’s silly but the kale massage is a must. Massage your kale with a little bit of olive oil to breakdown some of the tough leaf fibers and makes it easier for your body to digest them. Beets. I think you either love beets or you hate them but I challenge you to revisit beets this season if you thought they weren’t for you! Beets are a loaded with vitamins and minerals that are super unique to vegetables. I got the chance to visit the Love Beets beet farm this past summer and it’s truly beautiful how they grow in big fields and can be pulled right out of the ground. Beets are a good source of folate, fiber, and manganese. Beets also contain nitrates that is converted into nitric acid in the blood which helps to dilate blood vessels, leading to increased circulation and reduced blood pressure. Carrots. Another orange gold mine of nutrition, carrots are great to incorporate into your seasonal side dishes and soups! Another beta-carotene containing vegetables, baby carrots are a great snack year round, but this time of year it’s fun to get full size carrots for roasting! Carrots are a great source of complex carbohydrates and can be a great vehicle for more nutrition if you’re dipping them in guacamole, hummus or yogurt. Pomegranate. Did you know pomegranate seeds are actually called pomegranate arils? These magenta gems contain vitamin A, C, fiber, folate and many anti-inflammatory properties. I especially like them because they are easy to incorporate into anything, on top of salads, oatmeal, or yogurt bowls for a pretty seasonal twist of nutrition. Opening and peeling can be tricky. Submerge in a bowl of water, make an incision with a knife and use your hands to peel back the skin and pop out the arils. Brussel Sprouts. Also known as mini cabbages, Brussel sprouts start sprouting up at grocery stores at farmers’ markets and grocery stores this time of year and are part of the cruciferous vegetable family. High in vitamin C, K, and fiber Brussel sprouts are a great addition to the diet as the seasons change. They may be another polarizing vegetable, but again I challenge you to try them in a different way this fall to reap the benefits If your stomach doesn’t love them raw, try cooking them, which can help with digestion. Cranberries. You’ve probably had them in juice, dried in cookies, or sauce for Thanksgiving, but that’s all well and good because cranberries are a good source of many vitamins, minerals and healthy plant compounds that contain various health benefits. Maybe you’ve heard that cranberry juice is a must if you have a UTI, that’s because cranberries contain a type of phytonutrient that has been researched to protect against the process of how a UTI develops. What’s your favorite fall vegetable that you look forward to having back in your diet as the seasons change? Pin this guide to fall produce!